What Are the Risks of FUT? Follicular unit transplantation (FUT) is an effective hair loss treatment that creates natural-looking, long-lasting results. When performed by a skilled hair restoration surgeon, FUT is very safe. Similar to any surgical procedure, however, patients should educate themselves on the risks of FUT, and benefits of each of their options, so they can make an informed decision about their treatment. At True & Dorin Medical Group, Drs. Robert H. True and Robert J. Dorin use precision-placement techniques and operate within the highest safety standards to mitigate our patients' risk as much as possible. Patients suffering with thinning hair or baldness have several nonsurgical and surgical options available to them. Of course, nonsurgical options like hairpieces, topical solutions, and even laser therapy carry fewer risks than surgical options. However, surgical options like FUT offer much more natural-looking, successful results long-term. FUT risks are exceptionally rare, and our team is qualified to handle any issues that may arise during or after surgery. Patients who are interested in the benefits of a surgical treatment for hair loss will discuss their options with our team during an initial appointment. 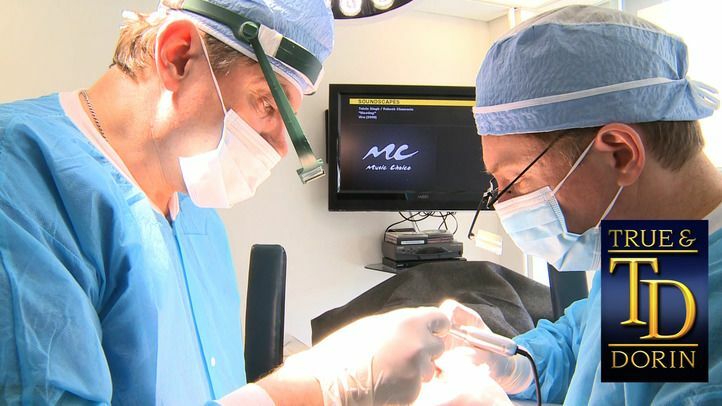 In addition to FUT, we also perform follicular unit extraction (FUE), a technique in which follicular units are individually harvested directly from the donor area of the scalp. Both types carry unique risks and benefits. After a member of the True & Dorin team evaluates your scalp and unique goals, you can decide upon a treatment method with confidence. Some risks exist for all types of hair transplantation, including FUT. Complications include infection, excessive bleeding, and blood clots. These risks are exceptionally rare, and our team is qualified to handle any issues that may arise during surgery. Other common surgical risks include pain during surgery, which we mitigate using a combination of local anesthesia and light oral sedation. For FUT specifically, the main risk patients face is being left with a visible scar from the scalp excision on the back of their heads. This risk, in part, was a contributing factor to the development of the FUE procedure, which does not require the excision of the scalp itself. However, at True & Dorin, we use advanced techniques to close the incision site, creating a negligible scar that is eventually covered as a patient’s hair grows in. Additional FUT risks include the death of hair follicles at the treatment site, an unnatural or patchy looking appearance, and in some cases, an unsatisfactory result that necessitates further surgery. By choosing a skilled, reputable surgeon like those at our practice, you can greatly reduce these risks. To learn more about your hair restoration options and whether FUT is right for you, contact True & Dorin online or call (866) 629-0866 today. Our team will help you explore all of your options so you can make an informed decision.